Festivalphoto recently asked The Undertones bassist Michael Bradley a few questions before the bands forthcoming tour. Festivalphoto: Your last album (excluding compilations) was released in 2007. Are there any plans for a new album? Michael: We have some new songs, and we hope to record them sometime next year. We havent practised them much , so we wont be playing them live this time round. Festivalphoto: Your current tour is the 35th anniversary tour where you'll be playing your first album in its entirety. What else can fans expect you to play on the tour? Michael: As the first LP is only thirty two minutes long, we will include as singles as we can. Then we’ll do the better songs from all the other LPs as well, including some from the albums we released with Paul singing, Get What You Need and Dig Yourself Deep. They’re due to be released digitally next month. Some great songs on them, even if I say so myself. Festivalphoto: Although you had several singles that reached higher chart positions than Teenage kicks, it's Teenage kicks that you are best known for, and its been re-released a couple of times. Why do you think Teenage kicks has proved so popular over a long period of time? Michael: Thats a good question. I think its short and sharp musically, and doesnt mess about before it starts. Also, the link with John Peel has made it an institution. Michael: The answer to that changes every week. Being on Top Of The Pops was great. Touring America, hard to beat. But one highlight for me was a short visit to Tokyo last year. We’d never played there, and it was only for two shows. But the fans were fantastic. We didnt think anyone would be interested, but they turned up for a signing session the night before the first show, with records from years back - as you’ve probably heard, they were very polite, kind and patient with us. Great memory. Festivalphoto: You've had a very stable lineup - where many bands go through lots of different members, the only change you've had is your singer after Feargal Sharkey declined to join the reunion. Why do you think you've managed to keep the lineup so well? Michael: I think its because we started off as friends, and have, on and off, remained so . The other thing is that we dont do it for a living. So if someone isn’t available to do something, we usually don’t do it. Paul is , of course, from Derry as well, so he fits in so well. Festivalphoto: Were you disappointed when Feargal Sharkey declined to join the reunion? Michael: Well, we didnt’ actually ask him. We had an idea he wouldnt want to, but some of us didnt want him either. So we didnt ask him, and he didn’t ask us why we didn’t ask him. Its complicated, and , to be honest, none of your business. Festivalphoto: Was it strange at first to work with a new singer after having had the same one for the original 8 years of the band? Michael: It was strange and a bit risky. We agreed to do some shows in Derry in 1999, without actually rehearsing with Paul. We all knew him , and knew he could sing, but it was only when we got together that we knew how it would work. Thankfully it was great. He had a very hard job filling Feargals shoes but I couldnt imagine doing it without him. Festivalphoto: John Peel gave a lot of bands including The Undertones a lot of help and exposure. Since his death, do you think radio gives enough exposure to new diverse talent or is it something thats now lacking? Michael: I work in radio so I would say the answer is yes. Certainly on a local level. Remember there are a lot more stations since John died, and the internet has meant more programmes. Whether Radio One and other national stations give enough exposure to new bands is another matter. I couldnt comment as I dont listen to them. Festivalphoto: What is your favourite type of live show and why - festival, large venue or small venue? Michael: I think small venue, although sometimes financially it makes things more complicated. But when you can smell the audience, then its going to be a good night. Festivals are great because you dont have to do a soundcheck You just turn up, plug in and play. And I love going round the stalls. A festival burrito is a thing of beauty. Festivalphoto: What bands do you think have influenced your music? Michael: The Ramones, The New York Dolls, The Stooges, The Buzzcocks, The Rolling Stones, The Beatles. Any band with ‘The’ in the title, really. 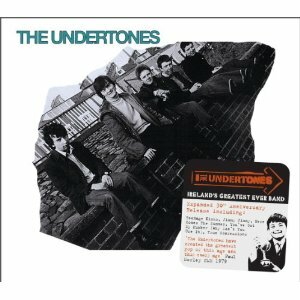 Festivalphoto: The internet has clearly changed the music industry, what do you think are the ways that the Internet is good for bands like The Undertones? Michael: Not sure. We dont have meetings any more - we just vote with emails. Then we can get information out a lot easier, rather than relying on an advert in the NME. Sending demos to each other is now a doddle. Need I go on ? Festivalphoto: And in what ways is the internet bad? Michael: Can’t think of any. Obviously the piracy thing but that doesnt really affect us. Not to my knowledge. And Youtube? How good is that for seeing clips of bands like the MC5 ?? Sorry, that should be in the ‘good things about the internet’ answer. Festivalphoto: Which do you prefer when you buy an album, and why - CD or legal mp3 downloads ? Michael: I prefer a CD, but if I need something quickly - for a radio show, for example, then the download. Fantastic technology, but I do like artwork and sleevenotes. For which you cant beat vinyl. Festivalphoto: What was the last album you bought? Michael: Real Cool Time Revisited , a compilation of Swedish garage and punk bands. Brilliant. Never heard of half of them, but they’re all great.